Hardy zone 6 to 12, often grown as an annual maturing in 120 days. Native to Southern Europe. 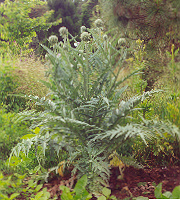 Produces large size, edible globes, flowering purple to 5 feet. 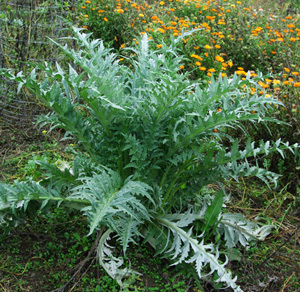 Plant prefers full sun and nitrogen rich soils. Sown in the spring, the large seeds are rewardingly dependable and fast germinators. Thin or transplant to 2 feet apart. Add more compost around the plant during the growing season. 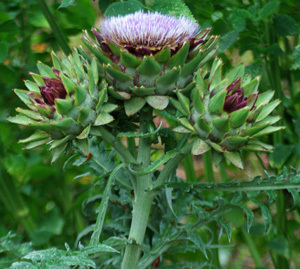 We note that this select organic cultivar of globe artichoke may be seeded in the early spring and will produce edible globes by fall. In warmer zones (6 and up) I would expect these to overwinter, in which case edible globes are produced in the late spring of the second year. The globes should be picked in the early stages of maturation, and steamed until the scales come easily loose. Dip in garlic butter or sauce of your own making.